So many special holidays are celebrated during this time of year, and each comes with specific traditions. 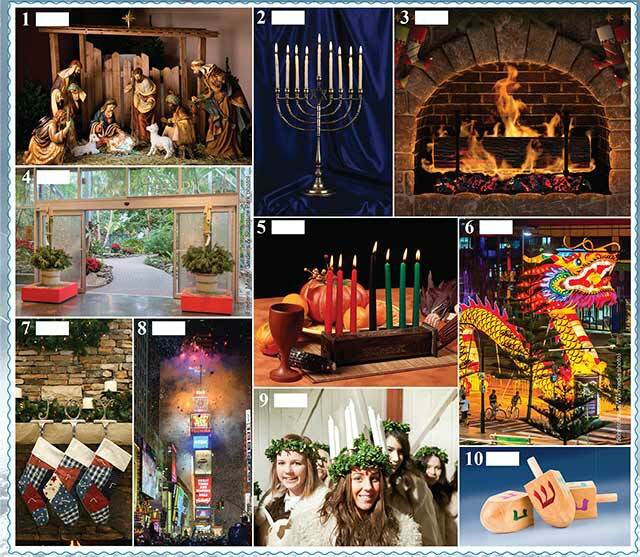 Test your knowledge of these winter festivals by matching each item in the photo to its correct holiday. Answers may be used more than once. No peeking! Answers are below. 1. D: Christmas. The nativity scene helps to tell the story of Jesus’ birth in a stable. Traditional scenes include his parents, Mary and Joseph, the manger where Jesus lay, barn animals, and the shepherds and wisemen who came to pay tribute to the Messiah. 2. B: Hanukkah. This Jewish holiday is symbolized with a menorah that holds nine candles. One “shamash,” or helper candle, lights one additional candle a day for eight days, each one commemorating the number of days that the Maccabees lasted on just one day’s worth of oil. 3. G: Yule. The traditional burning of the Yule log began somewhere in Europe and signifies hope that the new year will bring good health and happiness. 4. F: New Year’s Eve. The kadomatsu is a Japanese tradition at the new year. Typically placed in pairs, the floral arrangements are meant to welcome ancestral spirits, ward off evil and invite prosperity. 5. A: Kwanzaa. The kinara is a candle holder used to celebrate this commemoration of African traditions. A kinara holds seven candles that symbolize the seven principles of life, or the Nguzo Saba. 6. C: Chinese New Year. Dragon dances, fireworks, drums and the color red help to ward away evil spirits that could taint the new year, according to Chinese tradition. This year, the celebration begins Feb. 8, 2016. 7. D: Christmas. The Christmas tradition of placing stockings by the fireplace is thought to have originated with the real St. Nicholas. Legend holds that he snuck into the home of an impoverished family and placed gold coins in their stockings as they dried by the fireplace. 8. F: New Year’s Eve. Since 1907, the descent of Times Square’s glass ball has marked New York City’s welcoming of the new year. 9. E: St. Lucia Day. This Swedish holiday every Dec. 13 honors the martyr St. Lucia, who was killed by the Romans in 304 A.D. Traditionally, children parade in white gowns and wreath crowns that hold candles. 10. B: Hanukkah. Dreidel is a popular game played during the Jewish Hanukkah. Each side of the spinning top has a different Hebrew letter. Depending on which symbol lands facing up, one either takes coins from the middle of the circle or adds to it. Whoever has the most coins at the end wins. This entry was posted on Wednesday, November 25th, 2015 at 12:00 pm	and is filed under Northwest Quiz. You can follow any responses to this entry through the RSS 2.0 feed. Both comments and pings are currently closed.